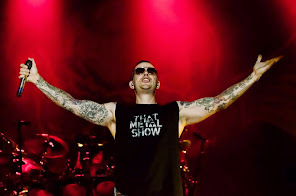 In case you missed it, M.Shadows said there will not be a second album as had been said in recent days. You can read the message below. "The other eye represents a human eye. Basically a nod to Paradigm in that it is half man half machine … I really should have kept my mouth shut about the evolving album. We will have some surprises and fun stuff but this is the main record. There are not two albums… we killed ourself with this one and two would have just been too much. If you go into the evolving record without expectations I think most people will really enjoy it."